Oil painting on canvas 23 x 28 inches, and contained its fine original carved wood frame of English Huguenot style. Joseph Van Aken is best known as the drapery painter to many fashionable London portraitists, including Thomas Hudson, Henry Pickering, Allan Ramsay and others. He was extraordinarily accomplished at painting clothes, and worked with a rapidity which endeared him to his brother artists. One of the reasons that good London portraits of this period are so difficult to attribute to one artist or another lies simply in the fact that Van Aken painted a considerable proportion of so many of them. There exists an amusing cartoon depicting the funeral cortege of Van Aken which was followed by the weeping figures of London's artistic community: they are weeping not for their departed colleague, but for the fact that they will now have to work a great deal harder to finish their portraits ! Van Aken's early career was centred on Belgium, where he received a thorough grounding in the techniques of life drawing and colouration, facilities which he never lost. 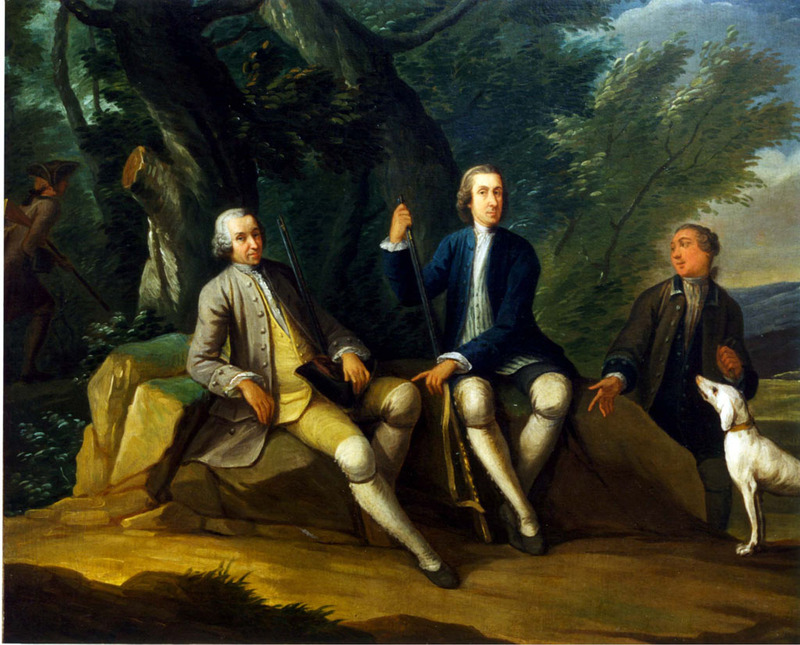 His arrival in London (noted by Vertue) coincided with a revival in the arts in this country, and the first blossoming of a native style in small domestic informal portraiture, of which Hogarth was in the van Van Aken's early paintings here are a mixture of continental technique and a bucolic English charm. 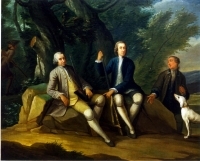 There are a number of sporting conversations of the present type (eg the "Sporting Conversation" exhibited in "Manners and Morals" at the Tate Gallery, (Nathaniel Robertson collection, USA) which depict the Rural Squire enjoying his sport in the company of his friends. The figures are rather elongated in a slightly mannerist way and adopt curiously "elegant" poses. They are a most interesting group of very early conversation pieces of a type which developed into an immensely popular genre in l8th century England.